Heads-up Arts Workers, here is an opportunity to gain an understanding of the new copyright laws in Canada. 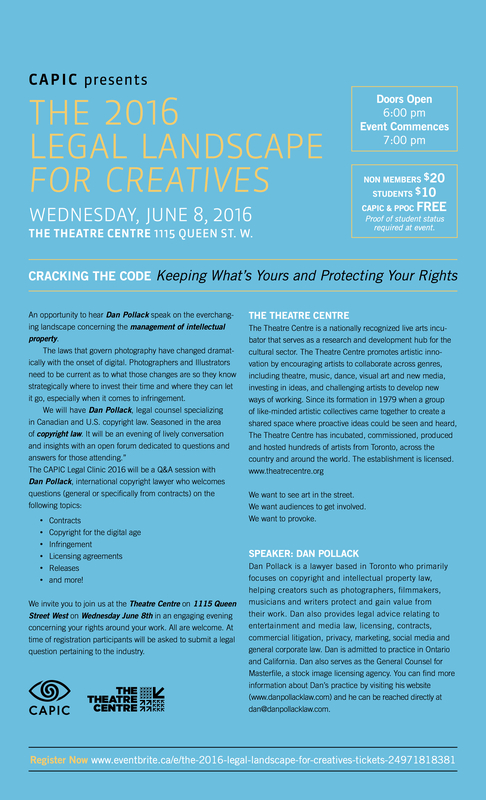 This CAPIC Legal Clinic will be a Q&A session with Dan Pollack, an international copyright lawyer. Feel free to ask on topics of contracts, copyright for the digital age, infringement, licensing agreements, releases, and more. The clinic will take place on Wednesday, June 8th at The Theatre Centre (1115 Queen St.West) at 7:00pm. CAPIC & PPOC admission is FREE.